These Hindu wedding ceremony pictures of Priyanka Chopra and Nick Jonas are beyond beautiful! 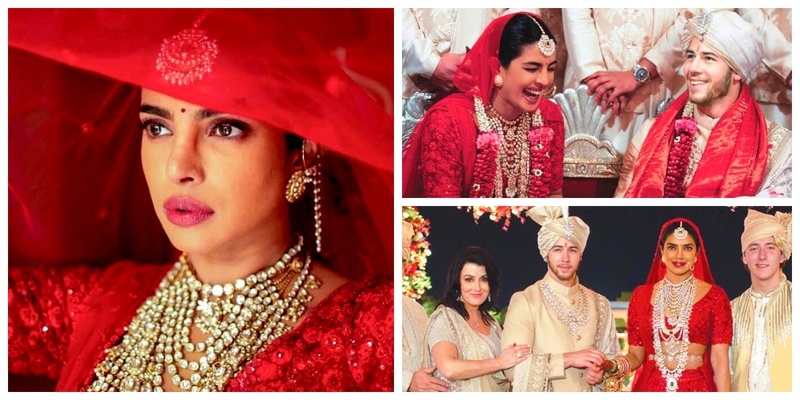 When Bollywood superstar Priyanka Chopra tied the knot to American singer-songwriter, Nick Jonas, earlier this week, the fans couldn't help but wait for the photographs and videos from their dreamy wedding ceremonies at Jodhpur. After all the duo did get married in an actual palace, which for me definitely overshadowed the Royal Wedding of 2018! It seems Priyanka only wanted red for her Hindu wedding and she was very clear about it. It had to be no other colour and no other shade, any gold or pastels taking away from the traditional look - so it was a full-on red on red extravaganza! Doesn't she look every bit ethereal? Her outfit has hand-cut organza flowers, fresh knots in silk floss, siam-red crystals and layers of threadwork, that constituted Priyanka's bridal ensemble! She wore a statement layered necklace reaching below the waist, a kamarbandh to accentuate her waistline, a maang tikka of the same diamonds and a nath to finish of the entire ensemble. I for one am totally loving that regal bridal entry, where she is seen entering the mandap under that red chaddar, complimenting her bridal lehenga. Also, it’s great to see a change from all that extravagant phoolon-ki-chaddars that I’ve been spotting in celebrity weddings lately! I see an excited Priyanka laughing her heart out as she tries to put the wedding garland on an equally excited Nick, and this moment is just too-cute-to-handle! This picture also sees Nick's mom Denise Miller Jonas posing along with the bride and groom and here’s saying the sasu-ma looks drop-dead-gorgeous too!